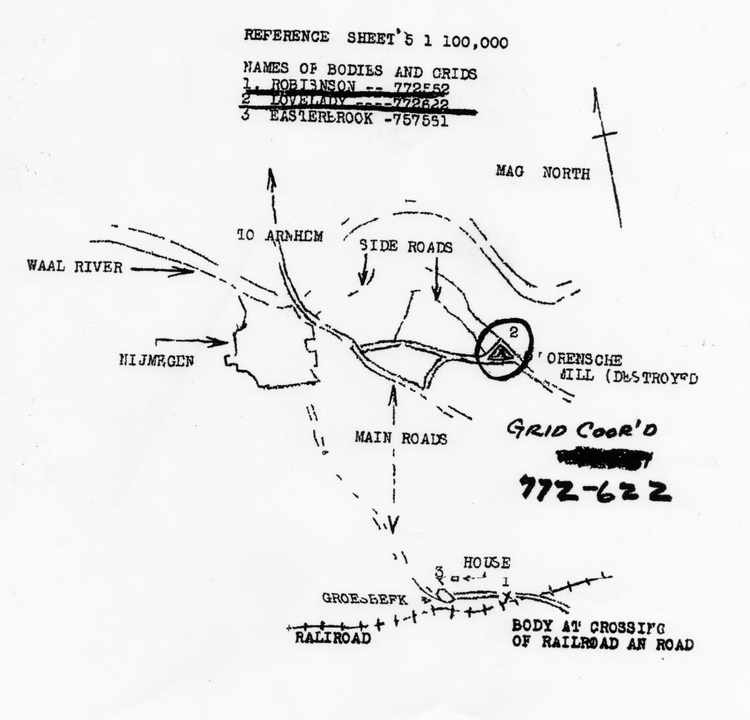 Graves Registration supplied a map of the location where George Lovelady's body was found. His isolated field grave was marked by a crude wooden cross simply marked "U.S.A." and was went undiscovered for quite some time. It was found by a local farmer, Wyers Jonssen who reported it Lovelady's grave is number 2 (circled) of 3 that are identified on the document. The 3 bodies were apparently collected on the same day and were interred side by side in the U.S. Military Cemetery, Margraten. a retired Corporal of the Dutch army who served in an airmobile/airborne unit. was deployed to Bosnia, Iraq and Afghanistan. 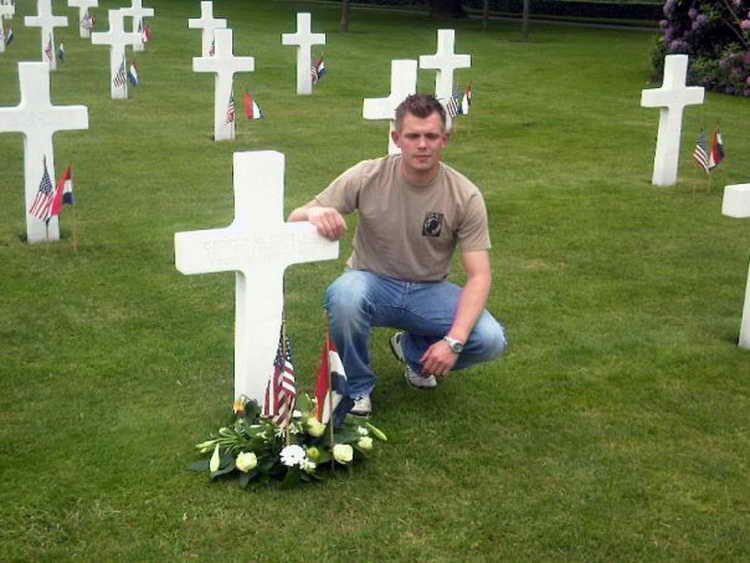 Martijn adopted the grave of George Lovelady not only because George was a liberator but also due to the fact that he served in the same kind of unit as Martijn. He said that he considers the adoption "... a great honour." 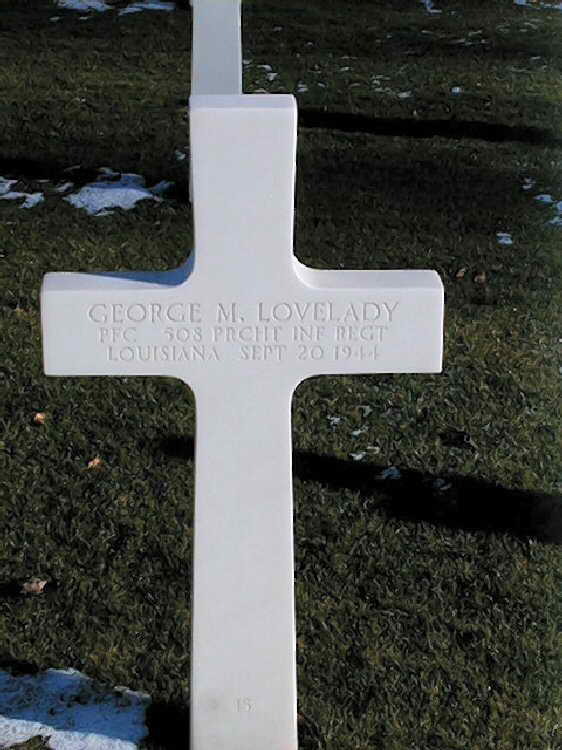 Headstone inscription and interment record and the resulting grave marker for Pfc George M. Lovelady at Plot P Row 5 Grave 15 in Margraten American Cemetery, Holland. 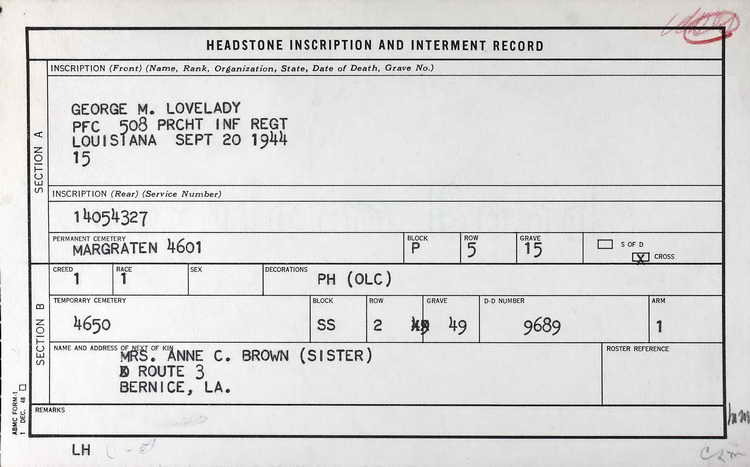 Pfc Lovelady was killed in action on 20 September 1944 and was awarded the Purple Heart with one Oak Leaf Cluster. He had been first wound in France on 14 June 1944 but was able to return to his unit on 9 August 1944.